115 registered members (53' Stude, 28oz, 240_Ed, AirBull, ad_infinitum, Amenhotep, 11 invisible), 2,109 guests, and 22 spiders. 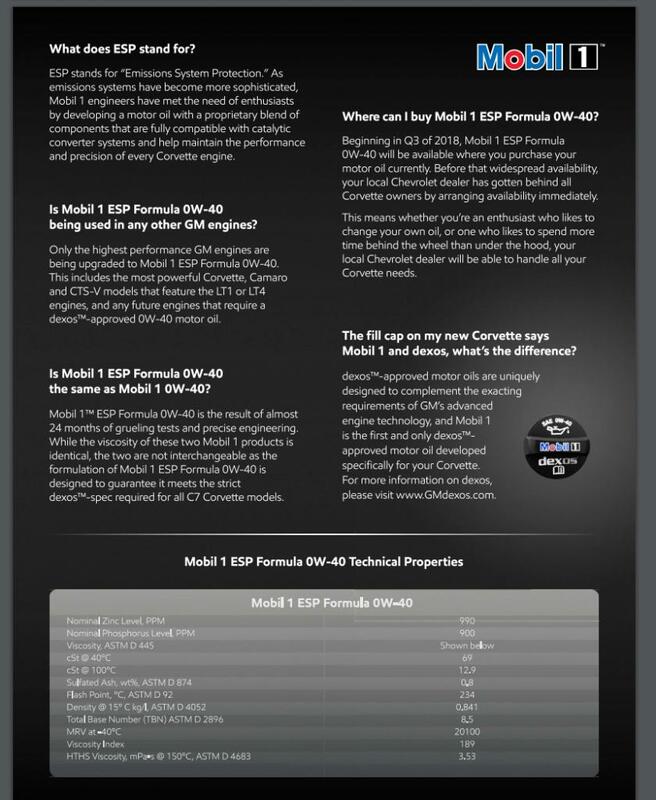 So as some of you know, there is a new dexos2 certified 0w40 Mobil 1 which is now the factory fill in 2019 Corvettes, and is backwards compatible to any prior Corvette engines that require a dexos certified oil. 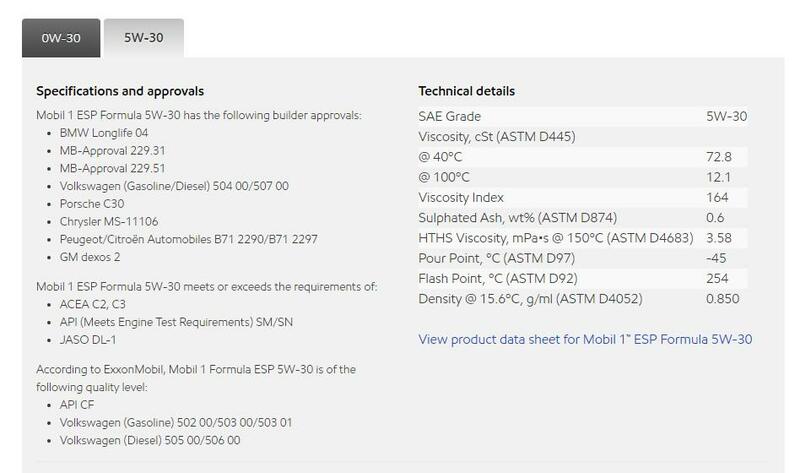 As I have mentioned in a couple of different threads now, it causes me to be interested in a couple of other dexos2 oils, but one in particular is Mobil 1's 5w30 ESP. And in looking at all of the technical data, it looks on paper like the 5w30 ESP might be a better choice than the 0w40 ESP. For instance, the HTHS of the 5w30 is higher (3.58 vs 3.53) Sulfated ash on the 5w30 is listed at 0.6, the 0w40 is listed as 0.8. And the flashpoint of the 5w30 is also higher, at 254C vs 234C for the 0w40. So if it turns out I can use the 5w30 ESP and retain my warranty, which of these two oils would you choose? 0W-40. That is what I will be using the next oil change in my 2.7 Ford pick up.A wee bit thicker to help with any fuel dilution ets and not a whole lot thicker to cause higher than necessary pumping losses. 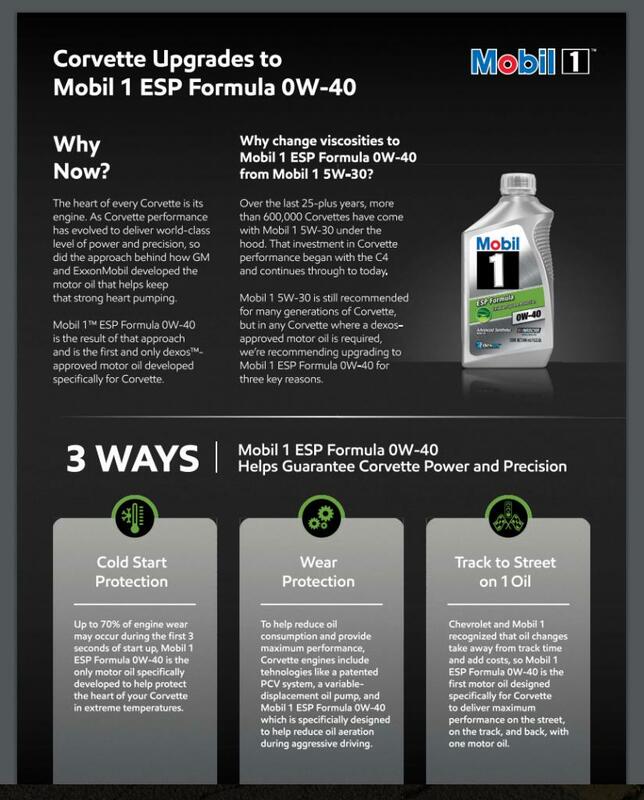 I'm also considering using the 5w30 ESP for my next oil change since I can buy it up here an Canadian Tire, and the 0w40 ESP won't be available in stores until probably the end of summer or early fall. The only downside I see to the 5W30 ESP (assuming extreme cold performance is not critical) is that it has a low starting TBN due to being a very low SAPS oil, so it is not at all suited for longer OCIs except on very low sulfur fuel. Patman, do you know what the sulfur levels are for the gas you get in Canada? The small HTHS advantage of the 5W30 could be an argument for it being even better than the 0W40 ESP for a very high performance application. M1 5W30 ESP was one of my choices before dexos1 Gen 2 oils came out, VOAs suggested to me that it should help mitigate LSPI and I liked the low SAPS, low NOACK loss, and high HTHS. I did notice that my car ran a bit hotter on it because it was thicker at temp than what I had been using and gas mileage may have suffered a bit, but not dramatically. I'd be OK with running it now, but prefer an oil that has actually been tested for LSPI performance and this stuff is quite expensive in the USA! Last edited by Virtus_Probi; 03/28/18 12:26 PM. Is this move to 0w40/dexos2 for all Corvettes from 2019-on, or just the special variants like the Z06 and ZR1? Remember, even the previous supercharged C6 ZR1 still called for 5w30 dexos1. I see the XOM recommendation to back-spec the 0w40 to all corvettes since the dexos program first started, but honestly, that might not be a good idea for the way most Corvettes are actually driven. And the ones that actually do use some of the Corvette's performance capabilities have probably already been using 0w40, albeit not the ESP version. There are a few dexos 2 5w30 oils available, such as PP Euro L at Walmart for about $25/jug, Valvoline's MST 5w30 at Napa for about $9/qt, and I believe Amazon has a Castrol dexos2 5w30 as well. Along with the M1 ESP 5w30 mentioned in the OP. Remember that Pep Boys does charge extra for the ESP in their M1 oil change specials with the 5qt and filter. I'm not concerned about the TBN since I won't be doing long OCIs, probably the highest the OLM would ever let me go would be 7-8k. Is this move to 0w40/dexos2 for all Corvettes from 2019-on, or just the special variants like the Z06 and ZR1? All versions of the Corvette are now factory filled with this oil. I have also considered the PP Euro L 5w30 too, I read on here that it might have an HTHS as high as 3.68. Sounds like picking nits to me. Intresting... acea c3 oil in a corvette. Like to see a uoa with this oil in a corvette. FS version over this oil anytime. Where would BITOG be without endless overanalysis of oils? So, what does it all mean. Is this 0w40 thinner? They used the UK formula as a starting point and reformulated it to come up with the version sold here in North America. Patman, why isn't there any Ford/Lincoln/Mercury vehicles listed in the chart above? Are they from a different planet and don't require 0W40?